In an effort to recreate the same triggers and responses as real world environments, where individuals crave and use drugs and alcohol, UH researchers are establishing safe and controlled simulated environments. Inside the “heroin cave” at the Graduate College of Social Work, individuals struggling with addiction wear virtual reality headsets, while a series of HD cameras project life-sized immersive 3D environments in which they would normally crave and use heroin. By measuring participants’ physiological reaction to these substance use cues, such as heart rate, respiration, muscle tension and galvanic skin response, research scientist Micki Washburn is developing strategies to help those with heroin addiction manage cravings in the real world. “Much of the recovery community simply encourages people with addiction issues to engage in a 12-step program and to avoid people, places and things that may trigger substance craving and substance use. That’s just not a realistic goal of recovery and often sets people up for failure,” said Washburn. “You can’t just avoid everyone and everything related to substance use, including your family or your community.” Instead, she said, people struggling with addiction need to learn concrete skills to cope with exposure to these triggers. A similar challenge of adapting realism in research exists for Professor Ezemenari Obasi, who investigates the relationship between chronic stress and vulnerability to alcohol consumption among African-Americans. His team analyzes levels of the stress hormone cortisol and other biomarkers. Experiencing racism and inequality over time, he’s found, can impact biological processes, putting them at increased risk for chronic disease. Ideally, Obasi would like to collect data at a real bar with people in their natural element. “But I can’t just walk into a bar with a questionnaire and video camera,” he said. He needed a bar, so he built one. 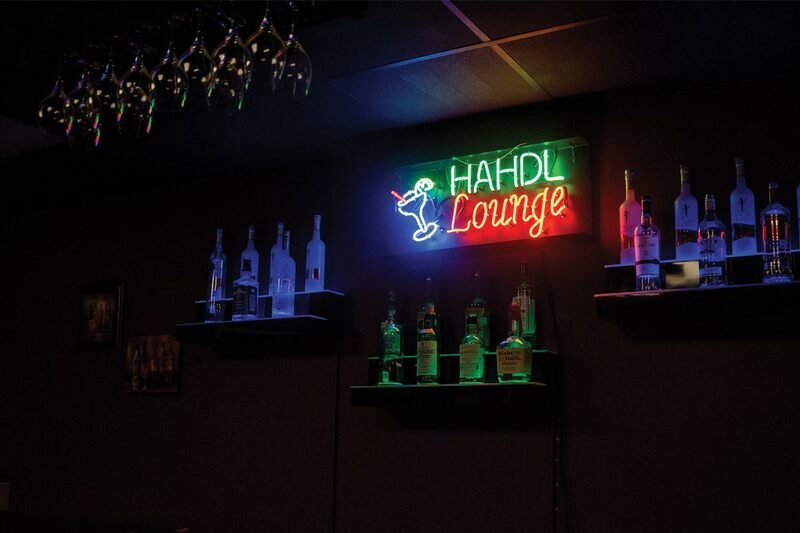 Complete with neon signage and liquor bottles, the black wooden bar seats eight inside Obasi’s Hwemudua Addictions & Health Disparities Lab at the College of Education. Soothing lounge music fills the air and competes with ambient noise from the TV mounted on the wall. For all intents and purposes, it’s a real bar. “It’s hard to make the case that doing research in a sterile laboratory setting translates into real life. This state-of-the-art environment puts a person in the right mindset, as if they were in a natural setting,” said Obasi. Generally, people aren’t trained to manage stress in a healthy way. After a hard day of work filled with deadlines, many go home to an alcoholic beverage and an immediate “escape.” But that instant gratification can lead to addiction. By studying the body’s response to stress, Obasi believes he can develop positive coping interventions. UH researcher sees promise in low-cost treatment for adolescents.